Hard tackles like this one by Thretton Palamo led to mishandling by Scotland in the first half. Titi Lamositele of Bellingham bulled over for a try to lead the U.S. national rugby team to a 13-6 halftime advantage over Scotland Sunday at Elland Roads stadium in Leeds, England. The Eagles’ hard hitting in their second match in the Rugby World Cup seemed to put the Scots off their game and several mishandles kept them out of the try zone. The U.S. scored first just past a minute in the game on a penalty kick by Alan MacGinty. But Scotland took advantage of mistakes by the U.S. to take the lead 6-3 on two penalty kicks. But at 20 minutes into the game, the Eagles won the ball from a lineout, had it out to the back line where No. 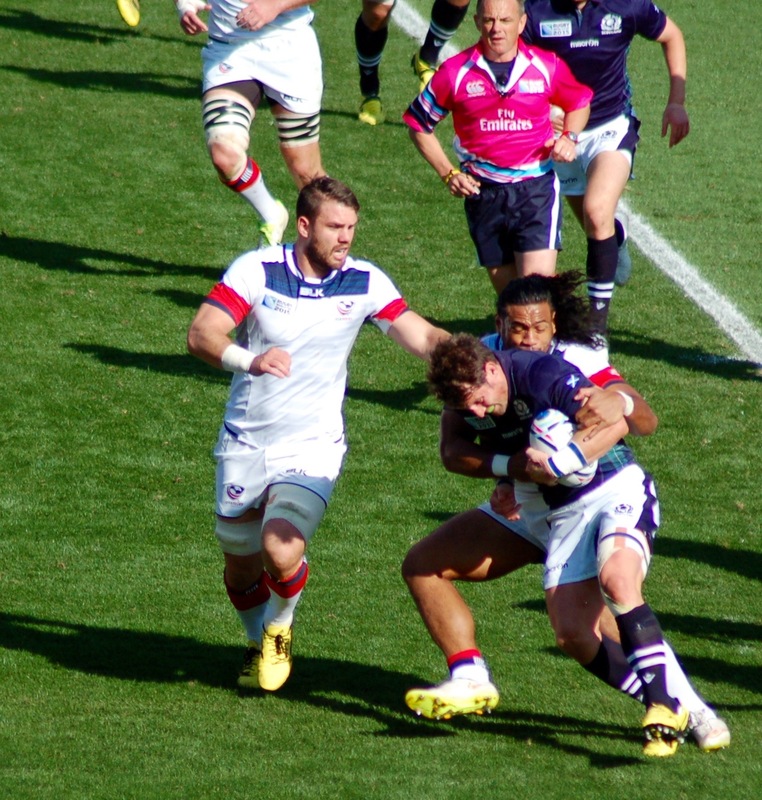 8 Samu Manoa filled in to crash through the Scots’ defense. Stopped about five yards out from the try line, the U.S. won several loose rucks before Lamositele took the ball from the ruck and pressed it into pay dirt. Posted on September 27, 2015 September 27, 2015 by jbsaulPosted in RugbyTagged rugby, Rugby World Cup, RWC, Scotland, USA Eagles.